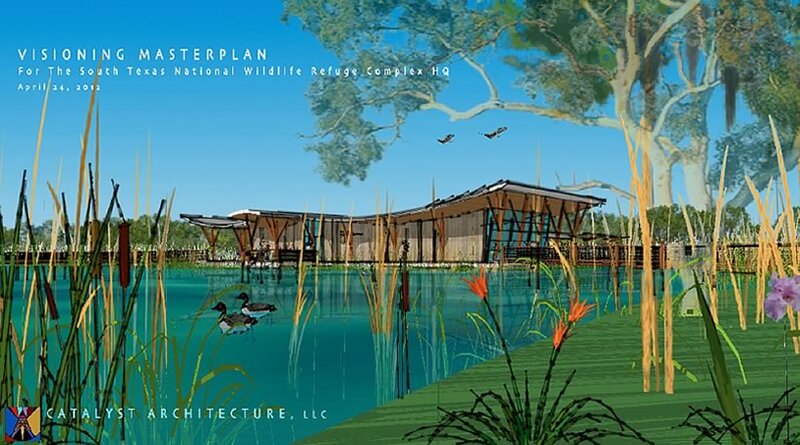 Our place-based interpretive design work for the Santa Ana NWR Visioning Masterplan draws upon numerous elements unique to this Lower Rio Grande Valley refuge. These include the broad gentle arcs of the visitor center's site development- recalling the Rio Grande river and its characteristic 'resacas' (remnants of the river's previous locations on the valley floor); the organic exterior column design that references the marsh plants, cattails, and low-land hardwoods of the Rio Grande valley; as well as the soaring curved roof lines of the Visitor Center building itself, which echoes the exceptionally diverse avian presence at the refuge, unique to this internationally recognized birding destination. Sustainability features for the proposed visitor center structure include a 35 kWh photovoltaic array, natural daylighting opportunities, locally harvested timbers, and deep overhangs for solar management and building cooling. Located on the US/Mexico border 10 miles southeast of McAllen, Texas, the facility has been conceptually designed as a net-zero energy building– capable of earning a LEED-Platinum certification from the USGBC.